Just kidding! I do still have migraine - and I always will. This pithy tag line is actually taken from a new TV ad commercial currently on in the States for Kmart Pharmacy. So, OK - the implication is meant to be, I think, that she's been faking 'migraines' or headaches to get out of having some intimate lovely dovey time with her husband in the evenings. 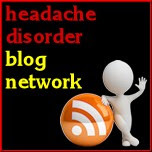 We all know the cliched saying "Not tonight darling, I have a headache". They've simply gone one step further. Part of me can see the humour they were trying to go for. 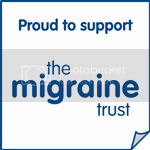 They couldn't have used any other condition as none is so closely associated with the old 'headache' at bedtime saying but.... a)I don't think this is really a very funny advert and b)sadly this just perpetuates the myth of migraineurs as fakers. It says to the audience at home, migraine isn't really very serious, migraine is just one of those things you can use as an excuse to get out of alone time with your husband, to get out of work. Just fake it. Too many people do actually fake having a migraine and this makes life really hard for those of us who genuinely suffer. Teri over at migraine.com has written to Sears, who own Kmart, to lodge a complaint. What do you think of the ad? Would it still have worked if she'd said 'Surprise: I don't have cancer!'. Don't forget TONIGHT is Book Club.